First and foremost, I ought to congratulate Ms Patricia Mukhim for the daring and incisive write-up on the status of policing in Meghalaya (ST Feb 8, 2019). I sincerely hope that the article will help straighten the goings-on in the Police department as well as policing in Meghalaya which are found wanting in almost all aspects. Constructive criticisms in the functioning of the Police Department and policing, from the public at large and from the media is most welcome and that is exactly what Ms Mukhim did in her column. I earnestly appeal to the public at large to constructively bring forth their criticisms against the style of functioning of the police and the Police department in the media or in other public fora. We need excellent policing in our state and we all want to see straightening and strengthening of the Police department. In this connection I would like to offer the following suggestions for better police functioning in our state. The DGP, ADGP and other top ranking officials should be selected from the corp of men and women of integrity, impeccable character, trustworthy and the best disciplinarians. The Police Recruitment Board should consist of not more than five police persons not below the rank of DIG and they ought to be men and women of integrity, trustworthy and an unblemished character. Educational qualification for recruitment to the posts of followers and constables should be not below graduation. Newly recruited constables and followers should undergo rigorous and stringent process of screening and training before induction into the police force. The process should be prescribed by the Recruitment/ Selection Board. Training for the new recruits should be streamlined perfectly and the training itself should be stringent and rigorous so that only the fittest will be inducted into the force. Strengthening and streamlining the District Executive Force is of imperative because as it is now the District Force is badly lacking in man-power. The present strength of the Police Force is hardly 30,000. The Police-Public ratio today is 1:500. The Police Station, Police Outpost, Police Beats and the Police Check Posts lack the man power (ill manned). The Investigation wing and Executive wing of Law and Order should be strictly separated so that there will be proper focus on the respective duties and to promote efficiency. There should be regular in-service training for police personnel to infuse efficiency and to update policing skills. Training on investigations should be streamlined and should be rigorous so that those police personnel in-charge of investigations will be highly efficient and justice will be given to the victims. Meghalaya has no Forensic Laboratory though the Police claims that it has one, but for all cases that involve forensic examinations the tests and examinations are sent either to Kolkata or Hyderabad. Therefore there is the urgent need to have our own fully functioning Forensic Laboratory here itself. These are some of the points and suggestion I can offer as of now. The Meghalaya Civil Services (MCS) Preliminary Examination was held in August 2018, after a gap of more than a decade. The result was declared in September 2018, but it is unfortunate that even after a span of over 5 months (and counting), the Mains Examination has not yet been conducted. We are all aware that the state government had declared in the past that this particular exam would be conducted on the UPSC model. By UPSC standards, the MCS Mains Examination should have already been conducted in November 2018 (that is after a gap of 2 months). It is very unfortunate that this delay is happening, as it affects the hundreds of successful candidates who will be burdened with the piling current affairs as the days and months progress. Also, it is not fair for many as they would have been age-barred with the passage of time. We appeal to the State Government not to play with the lives of the many serious candidates and to conduct the Mains Examination as soon as possible. We also appeal to the different NGOs to please look into this matter seriously. We are well aware that the elections to the Autonomous District Councils are being held this month. But why do common people have to be put through traffic snarls on a daily basis because candidates come to the DC’s office to file their nominations, accompanied by innumerable vehicles? Is this show of strength necessary? The entourage of vehicles accompanying every candidate has brought traffic to a standstill and hampered the movement of commuters pursuing their daily activities. The outcome of this avalanche of vehicles descending on Shillong city is that there is a ripple effect across the city. I believe such occurrences should not be repeated in the future and the Shillong Traffic Police should make rules disallowing vehicular processions within city limits to accompany candidates filing their nominations. 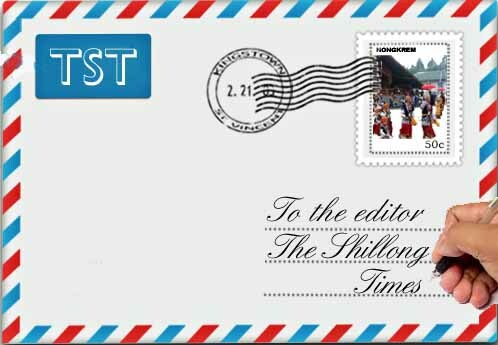 One understands the sentiments of the supporters but they have no right to inconvenience the public of Shillong. While it may be too late to implement such rules now since the filing of nominations for the Council elections ended on Friday, one hopes that for the ensuing MP election the authorities concerned address this grievance.